When American designer Oleg Cassini passed away on March 17, reams of obituaries celebrated his transformation of Jackie Kennedy into a style icon during her term as First Lady, his long-term success in the fashion business, and the fabled charm that captivated a series of well-known leading ladies. Perhaps Cassini was one of those on fellow designer Norman Norell's mind in 1965 when he said, "If only American designers would create their own designs, we'd be so strong. We'd influence the world. I want to scold American designers, and myself included." Naturally, as a designer and a gentleman, Cassini denied any such charges regarding the First Lady's regalia -- and with both parties now presumably wearing white robes and wings, we may never know for sure. 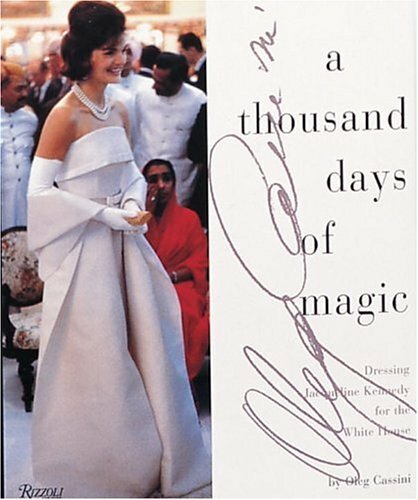 But originals or copies, at least the costumes of Camelot were "made in U.S.A."
As the latest battle lines are drawn -- Harper's Bazaar's Anticounterfeiting Summit v. Marie Claire's "Splurge or Steal?" feature, young designers v. established copyists, and almost everyone v. Urban Outfitters -- I have a strange sense of déjà vu. The women who pay several hundred dollars for original gowns have the right to expect that their gowns will not appear on the $10.75 racks in the stores the next week. Sound like a familiar issue? "Piracy in fashion is rampant," [designer Narciso] Rodriguez said, recalling a lunch meeting he had with senators last July, when he held up one of his $1,500 designs next to a newspaper advertisement for a nearly identical dress at Macy's, selling for $199. The prices may have changed, but the story remains the same. In every generation for the past century, fashion designers have protested their lack of protection under American law -- and little has changed. Why? And is anything different this time? 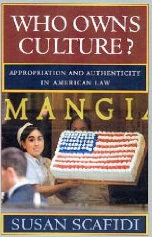 My short answer is that U.S. culture, history, and politics may finally have developed a new fashion sense. Stay tuned for more about the past, present, and future of this debate. In the meantime, take a look at the illustrations offered by the Times (Urban Outfitters at $48 (top); Bottega Veneta at $1,680). And yes, I can personally confirm seeing both in stores over the past month. 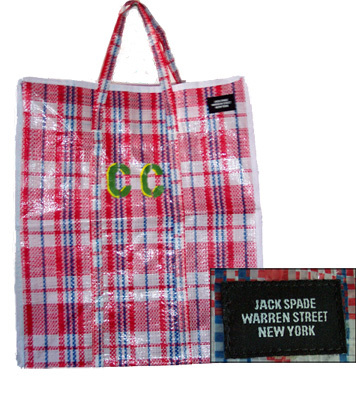 The sidewalks of New York's Soho neighborhood are cluttered with vendors selling copies of bags by Kate Spade and its masculine counterpart, Jack Spade -- often right outside the pair's respective boutiques. Despite new legislation, legal actions, and periodic police raids, urban counterfeits are as persistent as cockroaches. This spring, however, Jack is fighting back. The company has taken a clever new approach to knockoffs: if you can't beat 'em, parody 'em. The Jack Spade "Chinatown Collection," which debuted in February during New York Fashion Week, takes cheap plastic "made in China" tote bags and rebrands them with a real Jack Spade label. To drive the point home, the company even offers personalized monogramming of the bags -- check out Counterfeit Chic's stylish "CC" below. The Jack Spade bag has everything that real counterfeits do: flimsy construction, inferior materials, a low price, and an intentionally misleading trademark. It also has one thing that most knockoffs don't: a waiting list. Apparently Counterfeit Chic isn't the only one who appreciates Jack Spade's intelligent and amusing initiative. In fact, everyone who sees this tote smiles. Smart and funny -- what's not to like? 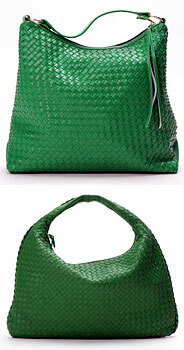 It's definitely our must-have bag for spring! China fakes: who's to blame? Silk Alley charity: philanthropy or PR ploy? Smith cautions that travelers need to educate themselves about the limits of the airlines' liability - no more than $1,250 per bag on domestic flights. In addition, most exempt themselves from paying for, in essence, all items except the bag itself and clothing, said Smith. "It is," he warned, "a caveat emptor situation." For those who want people to think their initials are "LV," a medium-sized piece of Louis Vuitton luggage went for $100, while a very good Vuitton knockoff sold for $30. 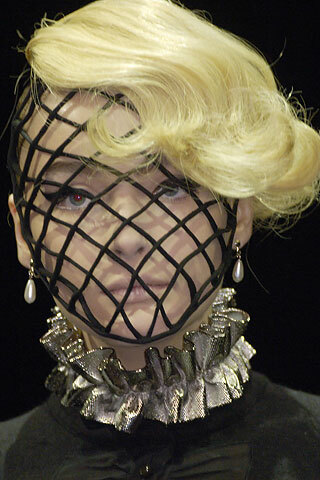 Japan's inventive technology informs many aspects of its fashion. A fabric display at the runway venue showed ultra-light synthetic fabrics, prints looking as though they were handcrafted and denim in myriad textures and weaves. While the contribution of science to fashion is nothing new -- from spindles to sewing machines, buttons to velcro, clothing has long been the product of technology -- invention has taken on a new urgency. [Naoko] Munakata [director of the fashion policy office at the Japanese Ministry of Economy, Trade and Industry] believes that with China taking over the fabric industry and copying clothes with cheap manufacture, there has to be a new initiative from Japan. "And that is where technology can help," she says. "We need to expose Japanese fabrics to designers to create high end brands." When it comes to Sino-Japanese conflict, at least fashion is a good theatre. In the forthcoming movie "Slammer," Sarah Jessica Parker stars as a publicist sent to prison -- mistakenly, of course -- for taking designer swag meant for clients and passing it on to knockoff artists intent on mass production. Musical comedy ensues. Can't wait for the release? Well, even counterfeiters can't get the DVDs on the streets before filming, but SJP is hardly the first to encounter knockoffs on the big screen. In the 1963 movie "A New Kind of Love," Joanne Woodward works for a knockoff guy who decides to take his staff to Paris for "inspiration." She meets Paul Newman on the way, and you can predict the rest. And if you find a recording of the original Broadway play "How To Succeed in Business Without Really Trying," you'll have to laugh at the song "Paris Original." In it, the secretary trying to land the up-and-coming young exec splurges on an "irresistible" and ostensibly one-of-a-kind designer creation, only to see every other woman who walks in wearing the same dress. Unfortunately, the song was cut from the 1967 movie version. At its core, the Big Apple is just a small town. Last weekend, I attended the grand opening of Project Runway contestant Emmett McCarthy's new boutique at the invitation of none other than my extraordinary octogenarian butcher, Moe Albanese, who also happens to be Emmett's landlord. Although the obvious pun would involve meat markets, Emmett's St. Paddy's Day launch was actually an enthusiastic family affair, complete with his proud mother passing hors d'oeuvres and collecting compliments. Also on hand at EMc2 was another PR contestant and the champion of geek chic, Diana Eng, whose new website with fellow designer Emily Albinski will be going live in a couple of weeks. The presence of two such creative but different designers (along with fellow contestant Kara Janx, who's already been copied) made me think about -- what else? -- the uneven levels of protection against knockoffs. Emmett designs beautiful and classic pieces that, apart from their labels, have barely a hope of intellectual property protection. (It's a bit ironic that scientific formulae like the store's moniker aren't subject to protection either.) Diana's technology-meets-fashion pieces, on the other hand, may qualify as "inventions" eligible for patent protection, assuming that the length of the process (a couple of years, give or take) and the expense don't make such applications impractical. Query: assuming the law doesn't change, how will such incentives affect the future of the industry? Congratulations to both Emmett and Diana -- and be sure to check out the boutique! Trinidad & Tobago ponders, "Is Culture a Business?" Except, of course, when beauty is NOT truth, as in the case of elaborately retouched fashion photos. Counterfeit Chic reader Peggy suggests we open our eyes to reality by checking out the faux beauties at Digital Pablo -- just move your cursor over the luminous models to see what they really look like. Some develop cheekbones or breasts, others lose freckles or blemishes, many get a tan or new hair. Given that even fashion's "before" pictures are the work of a team of stylists, makeup artists, hairdressers, and a professional photographer, it's no wonder that our own mirrors seem such harsh critics. Some retouching is so elaborate that it's unclear whether the underlying photo was really necessary. Take a look at Behnaz Sarafpour (below) after another retoucher, Glenn Feron, worked his dubious magic for Fashion Week Daily. According to an aphorism attributed to Otto von Bismarck, those who love laws and sausages should watch neither being made. It seems that the same goes for those who find truth or beauty in fashion photographs. Thinking about honoring your Celtic heritage -- or perhaps just borrowing a bit of the luck o' the Irish -- by incorporating a shamrock into your trademarks or designs? Think again, at least if you plan to market your goods in Ireland. Any person who wishes to obtain registration of a trade mark containing a State emblem (harp, shamrock) or to use a State emblem in connection with any business must first obtain consent from the Minister. Just a simple bit of green tape? Not exactly. The guidelines go on to state, "Authorisation to use the shamrock is restricted to goods or services of Irish origin." A thought for the fashion buffs out there: Would British designer Charles James and his famous 1953 "four-leaf clover gown" have been affected by this rule, had it been in force? Presumably the law wouldn't have reached that far, since only the outline of the hem formed a shamrock -- and, besides, his own rather nondescript name for the gown was "Abstract." A certain amount of designer inspiration amounts to larceny, the kind of plagiarism that, in the innocent days before appropriation became a sanctified part of the creative process, sometimes led to litigation or the occasional black eye. Archaeologists in Iran have uncovered evidence of a sophisticated fashion industry dating back approximately five milllennia. Not only have they excavated an apparent textile factory, but also dresses, jewelry, makeup, and clay stamps with family insignia apparently used to mark personal items. (Proto-monograms, anyone?) The scientists further suggest that the state-of-the-art textiles, used to create draped garments similar to saris, allowed both men and women "to wear trend-setting, colorful, designed pieces, which may have influenced the clothing styles of other regions." While a contemporary Zoroastrian text includes a a word for "artisan" that meant "he or she who makes good weaving," neither the word for "knock-off artist" nor the ancient H&M have yet been discovered. At a CFDA reception that I attended earlier this evening, Nicole Dreyfuss was one of the young designers on hand to remind Washington that the fashion industry remains concerned about knockoff artists. Nicole, who designs (and originally knitted) a successful line of handbags under the label Margaret Nicole, noticed last year that Abercrombie & Fitch was selling a suspiciously similar bag -- for a rock-bottom price. While Nicole's excellent media and legal connections helped her stand up to A&F -- her mother is NYU IP law professor Rochelle Dreyfuss -- the designer is concerned about others who generally lack protection under U.S. law. Most appropriately for an industry associated with creative/expressive women, the venue for the event was Sewall-Belmont House, the headquarters of the historic National Women's Party and former home of its founder and Equal Rights Amendment author Alice Paul. Love the subtext! Luxury retailer Neiman Marcus is suing pet boutique Neiman Barkus for trademark infringement (hat tip to The Trademark Blog), while at the same time distributing mail-order catalogs that contain an obvious (albeit probably legal) Bottega Veneta knockoff (left). And Finnish Minister of Culture Tanja Karpela, an anticounterfeiting crusader, was caught on camera carrying a fake Prada bag. I'm reminded of my years studying medival canon law (quite a switch to IP & fashion, but that's a long story for another day) and of a paper that I once wrote linking the "clean hands doctrine" back to the Fourth Lateran Council in 1215. The clean hands doctrine basically states that if you approach a court asking for relief in equity, you'd better not be guilty of similar misconduct yourself -- or you've got some 'splainin' to do. Today the doctrine is sometimes applied to actions involving the same set of circumstances -- e.g. the case of a parent who kidnaps a child and then asks for custody. It would certainly be interesting, though, if a plaintiff suing for IP infringement or a nation demanding international enforcement on behalf of its own industries were vulnerable to charges that it had "unclean hands." Is Russia's new anti-piracy bill strong enough? The brand's luxury image has been seriously hurt, at least in Britain,by its popularity with chavs, a rowdy working-class subgroup that has taken up the Burberry check as a kind of mass entitlement, tainting its appeal among fashion consumers. 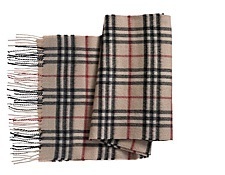 One chav Web site, www.chavmum.co.uk brazenly carpets its home page with the tan-and-black plaid [or at least did until Burberry lawyers read the New York Times this morning], and the chavs have helped to flood the market with Burberry fakes. Ugly pattern, clever analysis. Oh well, chacun a son gout. BREAKING NEWS: The paper of record has just realized -- gasp! -- that knockoff manufacturers are copying Oscar gowns. Round up the usual suspects. 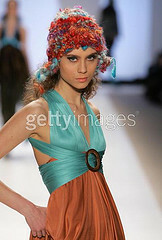 This year's Project Runway contestants are just launching their careers -- and the knockoff artists aren't far behind. The resourceful Cookie at Knitters Anonymous (for a reason, perhaps?) loved the hats that Kara Janx sent down the runway during New York Fashion Week (left) so much that she sourced the yarn, knitted a copy (right), and published her instructions. 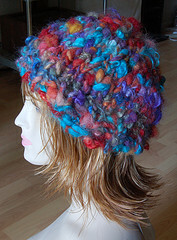 if you dont have enough money to afford kara's hats, you're welcome to recruit me for cheap labor... ;) well, i do knit a lot, so if you're BPR and want a handknit piece, lemme know! i do it out of love. Legal issue? Not with respect to copying the hat, and probably not with respect to using Kara's name (provided that customers aren't confused as to whether the copies are authorized and that the name isn't used as a trademark on unauthorized copies made for sale). Moral quandary? Perhaps not for a home knitter inspired by Kara to make her own version (in Cookie's case, sans ear flaps). But is professing admiration for a startup designer consistent with potentially undercutting her market and her attractiveness to much-needed investors? Knitting a Chanel-style sweater jacket -- for which I recently saw unauthorized instructions in a magazine -- won't overturn Lagerfeld's empire, but the effect on a young designer could be much greater. Viewed in property terms, "stealing" designs from the rich or the poor is indistinguishable -- but the actual impact is potentially quite different. So congratulations to Kara on finding a fan base -- now she just needs paying customers and capital. The insightful Andrea of Papierblog adds a series of comments about the awkward fit -- philosophical, not physical -- between certain celebrities and the brands they showcase on the red carpet or silver screen. Good point ! Congress has passed the Stop Countefeiting in Manufactured Goods Act, including provisions for the destruction of any property used in manufacturing fakes. Text of the bill is available by searching for H.R. 32 on Thomas. Once again, thanks to The Manolo -- and to Carnivale-goers everywhere! In response to the Sims' Oscar knockoffs, Marty Schwimmer of The Trademark Blog asks succinctly, "Right of publicity issues?" What does that have to do with a Sim knockoff of an Oscar gown? If the virtual gown for sale is depicted on the actress who wore it to the Academy Awards, that's an interesting question. Designers don't compete to dress celebrities out of concern that the poor girls can't dress themselves -- there are stylists for that. Rather, the free gowns, shoes, handbags (and rumored monetary compensation) are offered in the hope that the celebrity will be photographed and the image will be frequently editorialized. 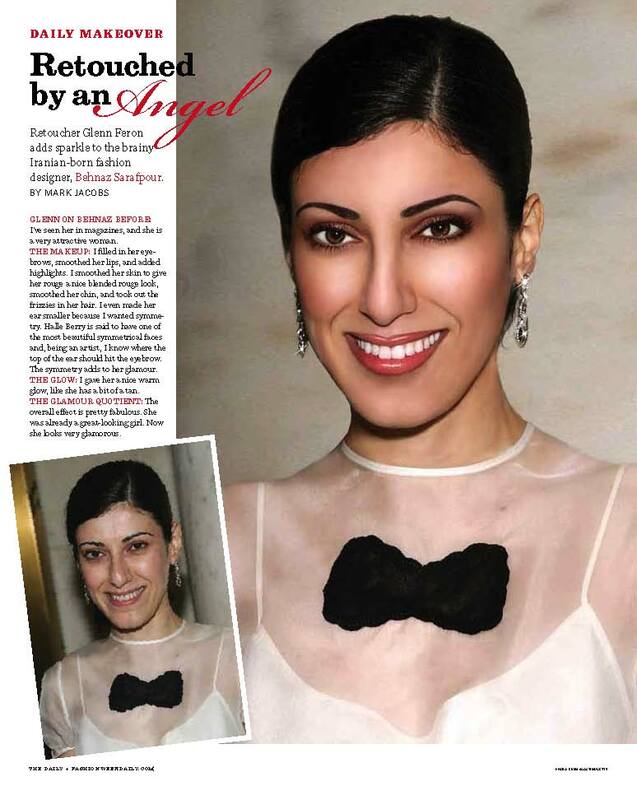 Money simply can't buy the kind of exposure that a Best Actress winner's dress will receive for free. So the nominees, presenters, and other beautiful people are in effect renting their celebrity status; their bodies become billboards advertising fashion houses. The ultimate idea is to draw attention to the brand and sell more dresses -- real, not virtual. So, if we view the agreements between designers and actresses as a financial transaction, the use of an actress' image to sell a virtual gown might violate her right of publicity. 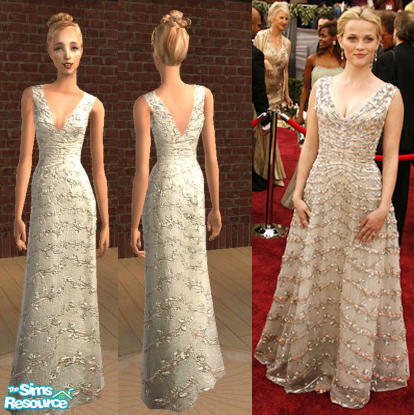 After all, what if Reese Witherspoon wanted to make money by modeling virtual gowns (as a Sim, she's certainly tall and thin enough)? It's a good thing that at the moment her real world far eclipses any virtual one. 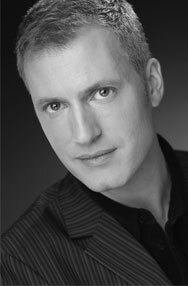 For more on law in virtual worlds, check out James Grimmelman's interesting and intelligent article and blog. 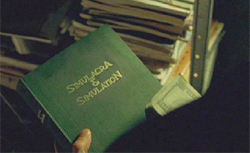 And for further reflection on the philosophy of copying, see Jean Baudrillard -- whose text also has a cameo in The Matrix. and don't forget a week of posts from Catwalk Queen! 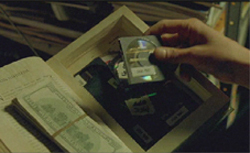 Can you sell counterfeits of an imaginary object? Absolutely, if demand exists in a virtual world -- like that of EverQuest2. According to New Scientist, prices for equipment like the Dark Shield of the Void dropped precipitously after some gamers discovered a way to make unauthorized copies. And when we say "prices," we're not just talking Monopoly money -- armor, weapons, and even characters are bought and sold for real as well as virtual cash. Computer gaming expert and keen gamer Edward Castronova at Indiana University, US, says duplication flaws are not uncommon in online games and notes that the virtual communities in such games can often regulate themselves, agreeing not to exploit such flaws to maintain playability. "Sometimes social norms can be effective," he told New Scientist. "Everyone may know that a dupe exists but it's like 'who cares?'" In other words, fighting with a fake Wand of the Living Flame is like showing up at Fashion Week with a knockoff Vuitton. Could there be real-world legal consequences? Well, software is subject to copyright, so its possible that if hackers copied and modified code there could be a cause of action. 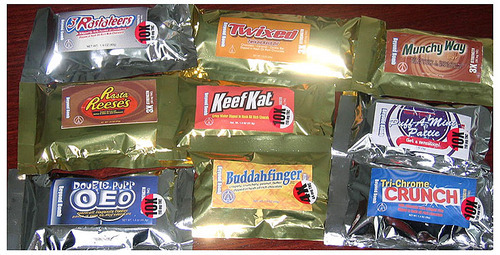 In addition, such behavior could violate licensing agreements. But illegal or simply illicit, the concept of distinguishing a "real" virtual object from a "fake" one is a mindbender. Just in time for Spring Break, the 11th Circuit is preparing to hear an appeal from Hooters, which claims that rival sports bar/grill Winghouse has stolen its trade dress in the form of the infamous "Hooters Girl." The venue? You guessed it -- Florida. Below are the two tackiest pictures ever to grace the pages of Counterfeit Chic. On the left, semi-clad in her white logo tank top and orange nylon running shorts, the Hooters Girl. (Orange. Nylon. Shorts. Need we say more?) On the right, in a black logo tank top and running shorts, the Winghouse Girl. In order to prevail on its trade dress claim, Hooters would have to prove that (1) the Hooters Girl, the predominant feature of its trade dress, is "inherently distinctive" or has at least come to remind customers of the restaurant (has acquired "secondary meaning"), (2) the Hooters Girl is predominantly non-functional, and (3) that the Winghouse Girl is confusingly similar. According to the District Court, 347 F. Supp. 2d 1256 (M.D. 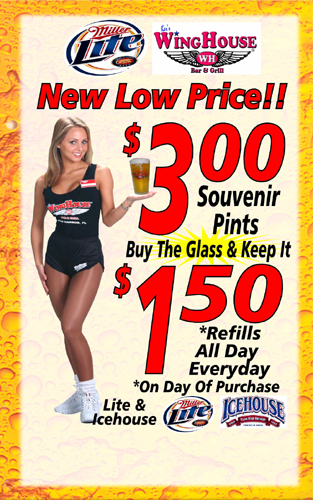 Fla. 2004), the claim fails as a matter of law because the Hooters Girl in uniform is primarily functional. And we're not talking about serving food and beverages. The judge found that "the Hooters Girl's predominant function is to provide vicarious sexual recreation, to titillate, entice, and arouse male customers' fantasies. She is the very essence of Hooters' business." Must be the orange nylon. The Hon. Anne C. Conway further noted that while servers in both establishments wear tank tops and shorts, "Hooters cannot monopolize this generic theme any more than an upscale steak restaurant featuring tuxedo-clad servers could preclude competitors from using the same or similar uniform." (Thank you for the substitute image, your honor; we'll focus on the tuxedos instead.) Thus the court concludes that "the Winghouse Girl, with her black tank top and black running shorts, is not a 'knockoff' of the Hooters Girl." The disposition of this case on appeal remains to be seen. Rumor has it, however, that a record number of judicial clerks have offered to review the evidence. I had been associate dean for years and I wore Ralph Lauren and Brooks Brothers. I wore suits every day and that’s just the way it was. I came to the department of Fashion Design. I had been here for about a year and a half and I thought I was an old stick in the mud. I needed to slightly edge it up. So I thought, I need a black leather blazer. So I went to Saks Fifth Avenue and I found one. It was Hugo Boss. It was gorgeous, and it was $800. I gasped and I bought it, and I thought, There’s my clothing budget for the whole year. So I walked across the street into Rockefeller Center where the Banana Republic flagship store is. I hadn’t been in Banana Republic for years. There was a black leather blazer for $400, and the two of them were indiscernible from each other. So I bought it and took the other one back. So, my guess is that Hugo Boss wasn't a Parsons alum. 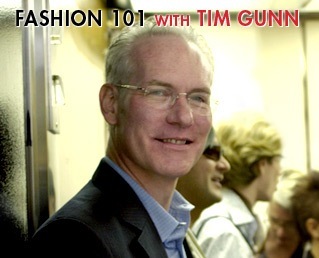 But on Tim Gunn, Banana Republic is definitely counterfeit chic. P.S. Hat tip to Blogging Project Runway. Goodbye, Mardi Gras, hello Lent. Today the last lost beads and stray feathers of Carnival are being swept off streets from Venezia to Rio to New Orleans. Here in the fashion blogosphere, however, the Carnivale of Couture (and of course, the Paris Pret-a-Porter) goes on! * why film is an "art" and fashion a "craft,"
* and, of course, Oscar Night. RSVP with your links to your posts, and I'll publish them on Monday, March 6. All are welcome -- and many thanks to The Manolo, our King of the Carnivale!